Colon cancer is common, with a higher rate in the Western population due to links with a diet high in red meat and animal fat, low in fibre and lacking in overall intake of fruits and vegetables. Lifestyle choices such as alcohol and tobacco consumption, obesity, and lack of exercise also seem to contribute to increased risk. Most colon cancers arise in polyps (benign growths), which over time acquire genetic mutations and become malignant. Colon cancer commonly presents with iron-deficiency anaemia, rectal bleeding, change in bowel habits [particularly to loose stools] and abdominal pain. It may present as an emergency with intestinal obstruction or perforation. Due to increased emphasis on screening, colon cancer is now often detected before it causes any symptoms. Once colon cancer is detected (usually on a colonoscopy or CT scan) it is important to ascertain the stage of the disease, since this determines the most effective treatment. The stage refers to the extent of cancer spread and consists of two broad areas: firstly, the extent of the local (primary) tumour, and secondly whether or not the cancer has spread to other organs. • Dukes A - the cancer is confined to the bowel wall without any spread. • Dukes B - the cancer has grown through the muscle layer of the colon but has not spread beyond the bowel. • Dukes C - the cancer has spread to at least one lymph node near the tumour. • Dukes D - the cancer has spread to somewhere else in the body, such as the liver or lung. 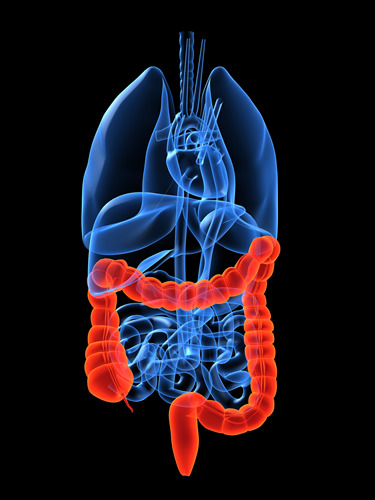 Treatment of colon cancer depends on the location and stage of the disease. Occasionally, colon cancer is detected in a polyp that is removed at colonoscopy; if the polyp has been completely excised, this is might be only treatment that is necessary to result in cure. However, most cases of colon cancer require abdominal surgery, with the aim of resecting the primary tumour with the surrounding areas of lymphatic drainage. The site of the tumour determines the exact operation. For cancer in the right colon, a right hemicolectomy is indicated, which can be extended for tumours of the transverse colon or high left colonic tumours. Left and sigmoid colon tumours require a left hemicolectomy. Certain patients (e.g. those with multiple tumours or polyps) may require a total colectomy and ileorectal anastomosis. In most operations, the aim is to resect the area of bowel involved, prior to rejoining two ends (either using sutures of special stapling devices). However, sometimes rejoining the bowel might not be feasible, and a temporary or permanent stoma (either a colostomy or an ileostomy, where the bowel end is brought to the abdominal wall skin and bowel waste goes into a bag), might be necessary. Most colonic resections can now be performed laparoscopically (key-hole surgery). Compared to open surgery, laparoscopic operations offer a reduction in size of incision, reduced wound-related complications, reduced pain and an earlier return to normal activity. Laparoscopic surgery for colon cancer has been shown in large studies to be as effective in the long-term treatment of the cancer as open surgery. All our surgeons are fully trained in laparoscopic colorectal surgery. Chemotherapy (cancer drug treatment) for colon cancer can help to improve survival in some patients with the disease. It is most commonly used after surgery [adjuvant chemotherapy]. 5-Fluorouracil [5-FU] remains the main drug of choice for chemotherapy regimens for colon cancer. It is used in selected patients with higher risk tumours and is usually prescribed in combination with a vitamin called folinic acid [also called leucovorin]. Chemotherapy is a highly specialised area and your oncologist will counsel you extensively prior to starting any treatment. We have close working relationships with our oncologists and all cancer cases are managed jointly with them.